The Mirafiori assembly plant in Turin will be upgraded and re-fitted to make Jeeps and Alfas starting in 2012. The Giulia sedan and a wagon along with the mid-sized(?) SUV that is targeted to compete with the X3 and Q5. Have the plants production will come to the US. The organizers of the Desert Classic just announced that in conjunction with the concours d'elegance, they are organizing a vintage race with VARA. Hope to see even more Alfas in the desert in February. Hope to see more Alfas in attendance in February in the desert. I went to the Best of France and Italy show last weekend and had a great time. It was Italian sensory overload. We had over 150 Alfas alone and by some accounts there were 400 cars at Woodley Park in Encino. By far the largest informal car show anywhere. The atmosphere was one of camraderie and appreciation of all marques without any of the snobbery of judged shows or concours d'elegance outings, not that I don't like those show also, I do, but this one was special. The cars that were shown were mostly drivers, some more than others, but all fun. Here's my photo album of the show and it is by no means comprehensive. 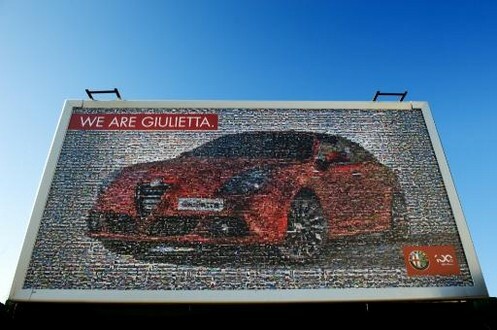 Cool artwork composed of thousands of pictures of Alfisti and their Alfas.